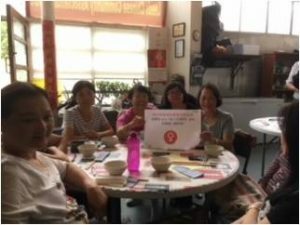 On the 24th July at the Leeds Chinese Community Association, Women’s Lives Leeds facilitated a Centenary Suffrage workshop, talking about women’s liberation and rights. It was an amazing kick start to Minnow’s suffrage workshops this year! We had interesting conversations about women’s liberation, women as the leaders and the change makers and inequalities in the home and work place. This was followed by more conversations whilst eating gorgeous authentic Chinese food! After we filled our tummies we dived into a creative session making paper lanterns using colours of the suffrage centenary movement (purple, green and white). 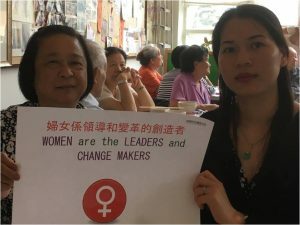 Women from the Leeds Chinese Community Association also made a collage using the pictures of famous, inspirational and powerful women including the last empress of China, Empress Dowager Cixi. 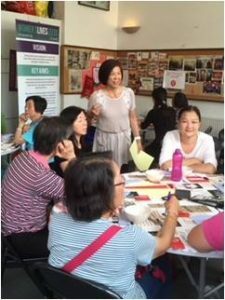 The next workshop is at St Matthews Community Centre on the 19th of September (find out more here), come along, get involved…be inspired to become a change maker!